Once you try snickerdoodles, there is no going back. But you know what is even better?! 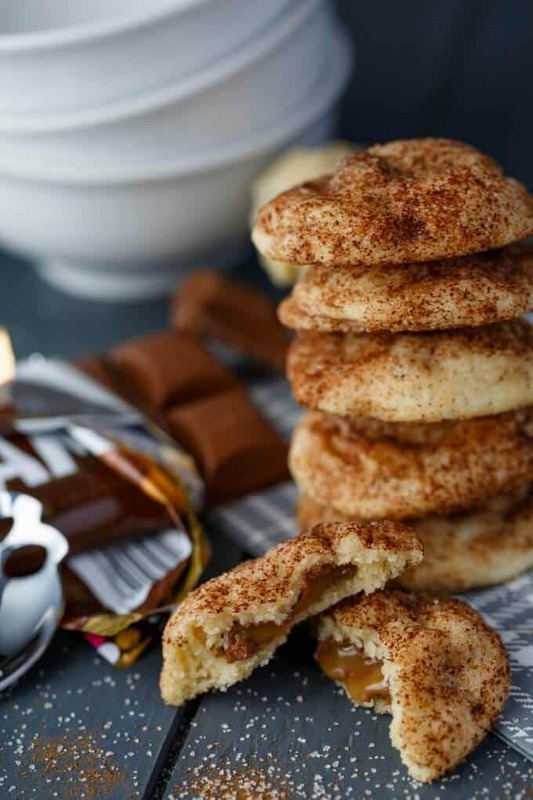 Caramilk stuffed snickerdoodles! The photos for these caramilk stuffed snickerdoodles have been updated as of December 6th, 2016! 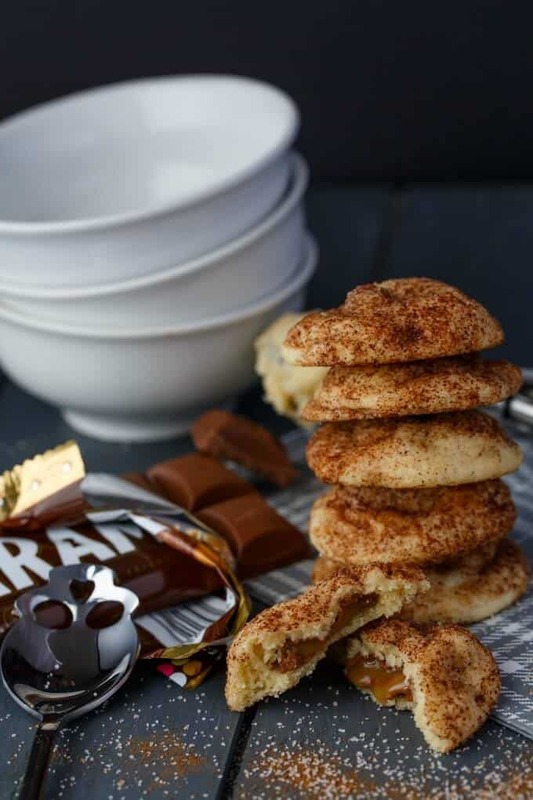 Snickerdoodles are a type of cookie that I was introduced to many years ago and fell in love! As you know, I am trying to update past cookie recipes, but sometimes a new and exciting post is necessary to bring out the wonders of an older recipe. I wanted to make my own snickerdoodles recipe that stood out from the rest. When I first started making snickerdoodles, I didn’t realize they were suppose to be big and fluffy. The recipe I had used was delicious, but would not pass the snickerdoodles test! Now I am here with my own version: Caramilk stuffed snickerdoodles! You can leave them un-stuffed for that same great snickerdoodle taste, but has chocolate ever hurt anyone?! Now, I probably would not have made these stuffed snickerdoodles had it not been for the over abundance of Halloween candy my daughter still has left! It is never-ending! I was rummaging through the bag (taste-testing a few things along the way) and picked out the chocolate bar I had the most of, which happened to be Caramilk (no affiliation.) The idea of biting into a cookie and being welcomed with a mix of chocolate and caramel was too hard to pass up. And that is how this snickerdoodle variation was born! Use up that leftover Halloween candy to make these decadent cookies! In the bowl of your stand mixer, add the butter and sugars. Cream until light and fluffy, about 5 minutes. Mix in egg. Add vanilla and mix. Sift together the flour, cream of tartar, baking soda, and salt in a separate bowl. Slowly add to wet ingredients and mix until JUST combined. In another small bowl, combine the granulated sugar and cinnamon. Measure out 1 tablespoon-sized portions of dough, flatten out the best you can, add 1 Caramilk piece into the middle, fold over dough and roll into a ball. Roll in the sugar mixture. Be generous and coat entirely! Repeat until no dough remains! Bake for 8 mins and allow to cool slightly on baking pan before moving to cooling racks. Note: You may have to manipulate the dough a bit to fit around the chocolate pieces, but do not worry, it works! 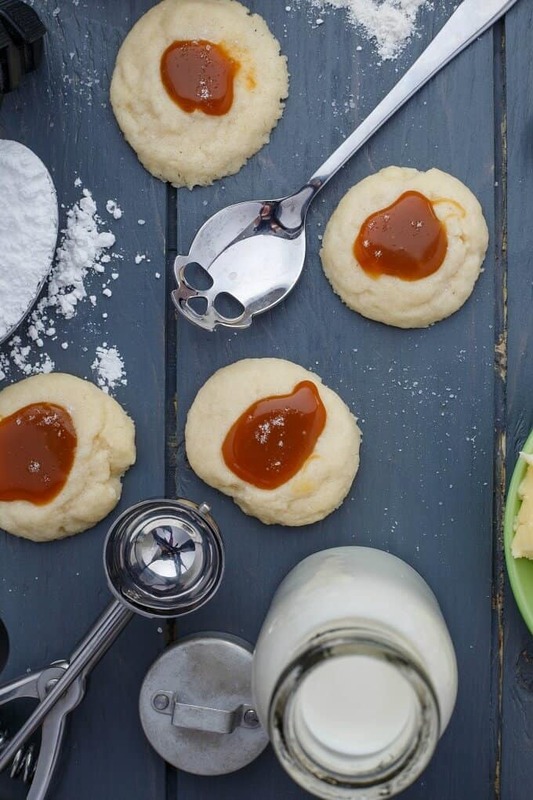 The cookie dough may get soft on you as you stuff the little rounds. Just pop them into the fridge to firm up a bit before baking. I adore Cadbury chocolate. What a great idea to stuff them in a cookie. Just when they couldn't get any better. Perfect. Those cookies look sinfully delicious. My whole family adores snickerdoodles and who can say no to candy?! What a great combination. I wish I could say "no" at times, lol. Thanks! Chocolate in a snickerdoodle!? That sounds wonderful and they look like a cookie to be proud of. Goodness, these look so good! 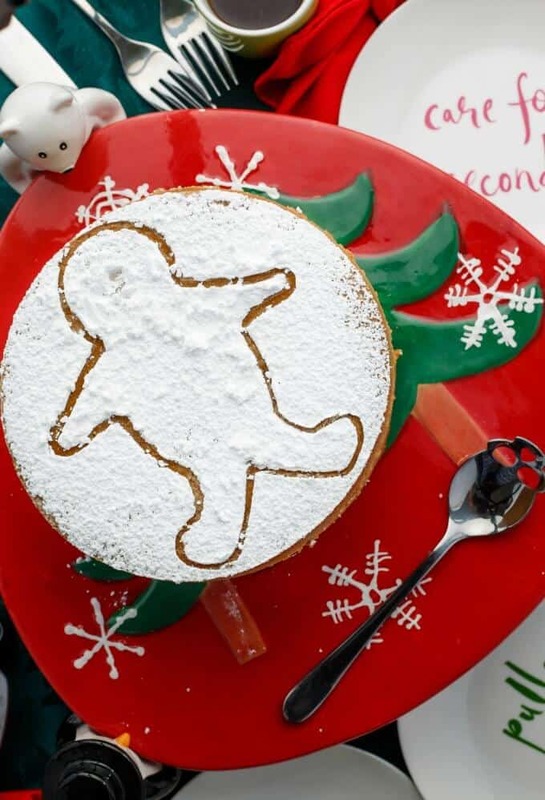 I love snickerdoodles and the added surprise in the center makes them even better. I love snickerdoodles! This caramilk stuffed version looks so dangerously good! Caramilk? How have I never tried this candy? 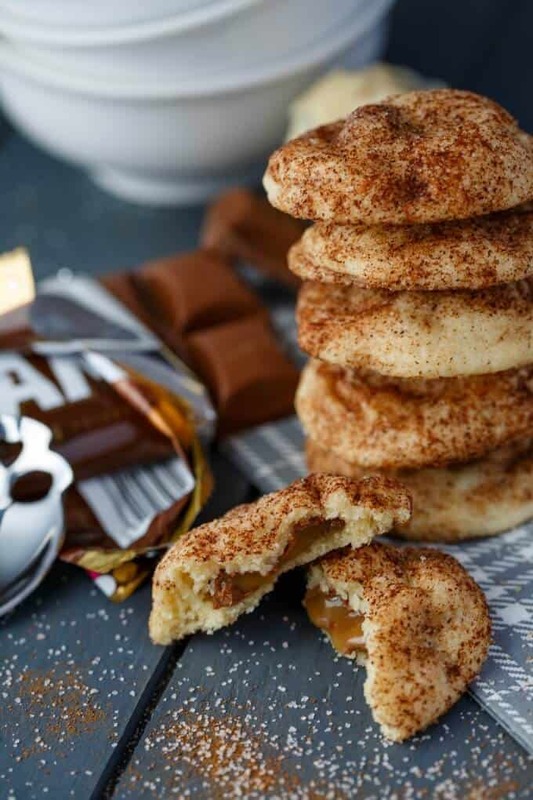 Such a great idea putting it inside snickerdoodles! If you ever come to Canada, you will see it everywhere! Snickerdoodles have long been my favorite cookie!! You took this to the extreme!!! I've never had or heard of Caramilk but it looks divine in that cookie! I have a hard time saying no to any snickernoodle, this one I wouldn't be able to resist. These might be the best snickerdoodles ever!! I love caramilk and putting them in a cookie sounds so good! I love a good stuffed cookie! These flavors are perfect together!! Hi Kacey, I found your blog throu Pinterest and I loved the concept of a filled snickerdoodle. My husband always wants me to bake chocolate chip cookie and brownie ...So when I said I'd baked snickerdoodles with caramel, actually I filled them with toffee too. Well he wasn't interested ... said he was going to cut back on sweets anyway! When he got a taste of the snickerdoodles his words were "these are amazing!" I agree with your comment, I don't think I can eat snickerdoodles the same way again either... The chocolate didn't really turn out as creamy and melty like yours looks, as I'd hoped they would. So I nixed it for now. I have featured your recipe and blog in two post i on my blog http://michelescafe.blogspot.com/2015/12/this-weeks-cookie-snickerdoodles.html and http://michelescafe.blogspot.com/2016/03/chocolate-monday-perfect-parfait.html ,other ways I've used and tried the same recipe for the cookies. Thank you so much. Yay!! No harm in experimenting :) That is the only way we learn! Thanks so much for the nice comment!